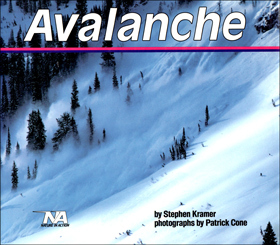 Every year, as many as one million avalanches fall throughout the world. Over 100,000 occur in North America alone. One moment, the mountainside is calm; the next, tons of packed snow and ice come thundering down the mountain, burying everything in the way. Only a trail of broken chunks of snow is left to show that one of nature’s most powerful forces, an avalanche, has just happened. Through fascinating facts and spectacular photography, author Stephen Kramer and photographer Patrick Cone explain to readers the causes and effects of this awe-inspiring natural phenomenon.